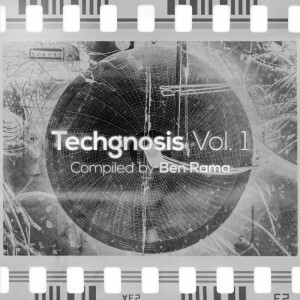 Techgnosis Records and Drumlore invite you to explore the vast spectrum of modern techno music with Techgnosis Vol. 1, compiled by Ben Rama. From the dark and psychedelic to the more melodic and hypnotic, with glimmers of old school acid aesthetics and a minimal attitude, this compilation features nine stand-out tracks from producers across the globe. Mastering on tracks 1 and 3–8 by Sonic HQs Freiburg, Germany; mastering on track 2 by Charles Michaud, Preference Mastering; mastering on track 9 by Dan Driscoll. Original photography and design by A. Synaptic. MP3 Download | FLAC Download | WAV Download · Download count: 24,108. Great techno compilation! Thank you artists for sharing, Happy New Year! Mmm, BAS. erm BASE, erm BASS… erm… deep delicious frequencies. Great Music ! and ! This compilation is so rad. So cyberpunk. Great job guys, and thanks Ben! Bloody brilliant release boys. Every track is just slammin’!